This data policy contains important information on who we are, how and why we collect, store, use and share personal data, your rights in relation to your personal data, and how to contact us. BDVA is an industry-driven and fully self-financed international non–for-profit organisation under Belgian law. 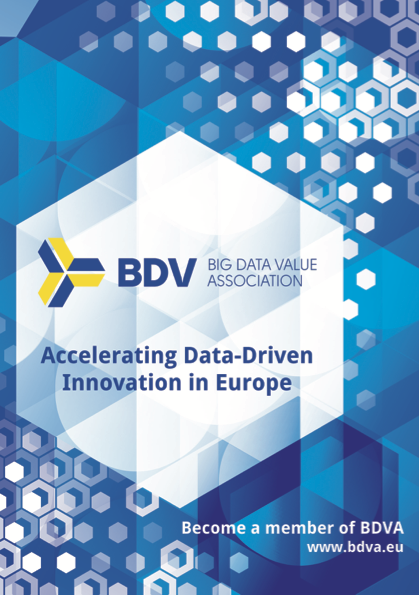 BDVA has almost 200 members all over Europe with a well-balanced composition of large and small and medium-sized industries (over 30% of SMEs), as well as research and user organizations. The mission of the Association is “to develop the Innovation Ecosystem that will enable the data-driven digital transformation in Europe, delivering economic and societal benefit, and, achieving and sustaining Europe’s leadership on Data-Driven Value Creation and Artificial Intelligence”. BDVA is the private counterpart to the EU Commission in implementing the BDV cPPP programme. In both cases you are requested to fill in a form. We gather information about your name, job tittle, work email address, company, company profile, city and country. We collect your work email address as the main channel to distribute our monthly newsletter and other relevant communications mainly about community events and opportunities. We collect information about your company profile for internal statistical processes. This information is stored in our CRM system and it is not shared with any third parties. Technical information about IP address of the requesting processor, Date and time of access, Name and URL of the downloaded file, Volume of data transmitted, Indication whether download was successful, Data identifying the browser software and operating system, Web site from which our site was accessed, Name of your Internet service provider. Information about pages you visited in our Website, page response times, download errors, length of visits to certain pages, page interaction information (such as scrolling, clicks, and mouse-overs), and methods used to browse away from the page. The purpose of recording these data is to allow use of the Web site (connection setup), for system security, for technical administration of the network infrastructure and in order to optimize our Internet service. The IP address is only evaluated in event of fraudulent access to our network infrastructure. Page views and downloads are only used for internal statistical information of our communication channels performance. Register to any of our events, we collect information about your name, working email address, job position, company and company profile, city and country. The information collected is only used for the specific event communications and statistics and we will ask for your explicit consent to use your data for any other purpose (mainly for communications activities). We use both own systems (BDVA CRM) and external systems (Eventbrite) for event registration. We collect your organisation profile and data when you apply for BDVA membership. This information is stored in the BDVA CRM. The main contact point (individual) of a member organisation (and officially authorised person) can (and should) update this information at any time. You self-register to email distribution lists. In general only name and email addresses, linked to your organisation as member, is required, stored and processed. If you register to the BDVA CRM, you organisation, job tittle, work address, city, country and telephone number can also be stored (not necessarily all). BDVA does not collect sensitive personal data from you. In case a specific event or situation would require us to do so (e.g. security check in event registration where ID number, date of birth or similar might be requested) we will only do so on the basis of your explicit consent and specific data privacy information. The use of certain services on our website, such as newsletters or discussion forums, may require prior registration and involves a more substantial processing of personal data, such as longer-term storage of e-mail addresses, user IDs and passwords. We use such data only insofar as it has been sent to us by you in person and you have given us your implied prior consent for this use. Registration is done through the BDVA CRM system (CiviCRM) owned by BDVA and hosted by Civihosting in European located servers. BDVA uses e-mail distribution list. Most of the BDVA e-mail distribution lists are for members only but there are email lists open to all interested individuals. Subscription and un-subscription to the e-mail mailing lists is done through self-registration or specific request in written to the BDVA office. The BDVA email distributions lists (extension @core.bdva.eu) are provided by the BDVA email server. The BDVA email server provider is CiviHosting. BDVA members have access to an online working environment (SAP JAM) by invitation only, Members of BDVA are registered and unregistered under explicit request. We don’t share your personal data with any other third parties unless you give us specific consent to do so. All use of your personal data is confined to the purposes stated above, and is only undertaken to the extent necessary for these purposes. Your data is not disclosed to third parties systematically. If, exceptionally, one of our applications requires the storage of personal data in a cookie, for instance a user ID, we will try to point out you to it. We may use social plugins in some cases on our webpages, e.g. from the Facebook, Twitter, YouTube or Google+ social networks. If you open a page of our website in your web browser containing such a plugin, your web browser will create a direct connection to the servers of the respective provider in the country concerned. Our Web pages may contain links to other providers' Web pages. We would like to point out that this statement of data protection conditions applies exclusively to the Web pages managed by the BDVA. We have no way of influencing the practices of other providers with respect to data protection, nor do we carry out any checks to ensure that they conform with the relevant legislation. Your Rights to your personal information access, modification and deletion. In some cases, if you are a registered user of certain services provided by BDVA, we offer you the possibility of inspecting these data online, and even of deleting or modifying the data yourself. BDVA has created the dataprivacy@core.bdva.eu email account to answer specific questions related to data privacy and to help us to learn and improve based on your input.